It seems unbelievable that we are into the fifth month of the year already. It was only some time back that we all were making grand plans for the New Year (at least I was). While I am happy that I have worked on some areas of my life and am happy with the progress I have made. But, that’s not what made me stop now and ponder over the happenings this year, till now. The universe has a unique way of responding to our wishes and time and again it leaves surprised, as to how it manifests the things that one asks for. 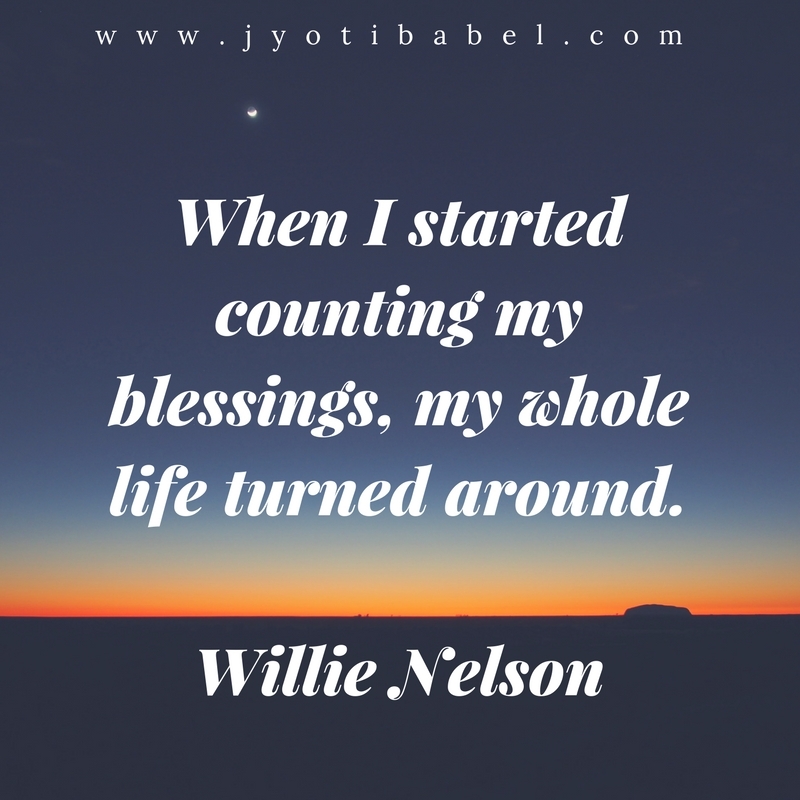 Past few days have been a roller coaster ride for me – it is incredible how someone comes into your life - like a gush of wind - out of nowhere, connects with you instantly, and puts your life in perspective for you. The happenings past few days put me in a mood for introspection and deep contemplation and at the end of it, I was just left with one feeling – Gratitude. 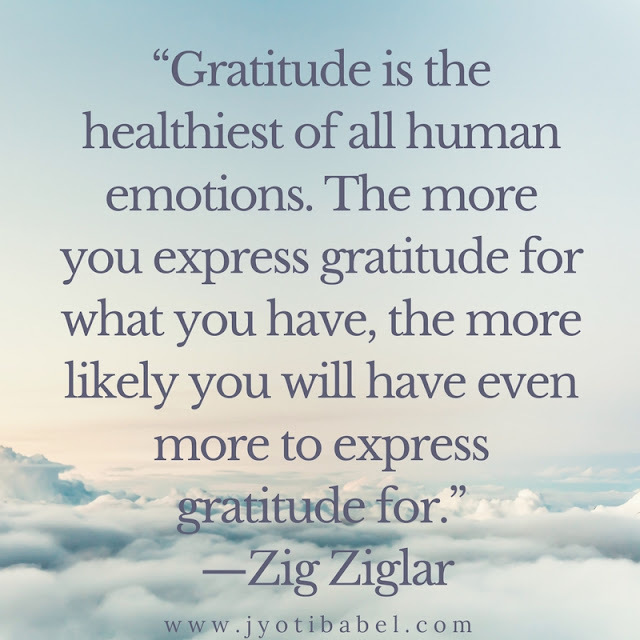 It is a feeling of happiness that comes from appreciation. And I am learning to cultivate it - one step at a time. It has been a while since I mused about my life, in general, in this space here. So, today I take this opportunity to ramble it out. It is going to be a long one. So, please make yourself comfortable. But, before that let me express my thanks for two fabulous bloggers that I had come across virtually last year – Vidya Sury and Shailaja. 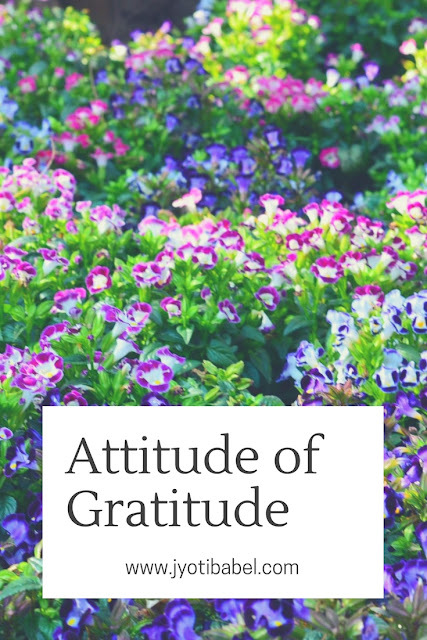 Their posts on gratitude have always touched my heart and in the process have inspired me to cultivate an attitude of gratitude. If you have not checked their space, do check out and I am sure you will love it there. I am forever in debt to them for the inspiration - as I know now, it is such a fabulous and rejuvenating feeling. 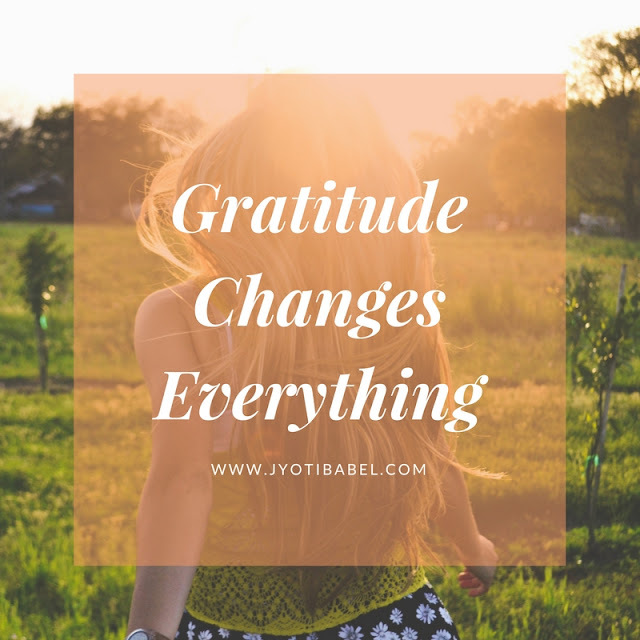 I am joining Vidya’s gratitude circle for the month of April, although this post is not just about April, but for the whole of this year till now. We didn’t have a great start to the New Year. We welcomed the year tending to our baby who had been falling sick repeatedly after we came back from a short vacation to Ganpatipule during the Christmas holidays. As parents, it worried us and made us sad to see our baby suffer so much - fever, persistent cough, cold, vomiting, - and what not. It went on for over 2 weeks and only by the mid of January our little one was feeling better. It’s difficult to find a reason for gratitude when your child is suffering. But, one of the thoughts that I had in my head, despite the sad feeling, was it must be doing something good to his immunity and increasing his resistance power. Kids do fall ill and it is a part and parcel of their growing up. I was also grateful that in that trying time I had my MIL by my side for emotional support. Once the LO was good and going, it was time to join back his preschool after session break. After a 2 rocky two months last year in the school, it seemed he was finally settling down and had started to enjoy his time there. Another big deal for me was that I could carry him in my scooty to drop and pick from school. While I had been riding the scooty for quite a while, carrying a 2-year-old to and from school on it needed a bit of conviction on my part. I am glad that I don’t have to depend on anyone now to carry him around – such a grateful feeling. The month of February was a fast one for us and a very special one too. We celebrated little one’s 2nd birthday with much fervour with family in Kolkata. Nothing beats celebrating special occasions with family. Isn’t it? It is such an exhilarating feeling to see our bundle of joy grow up into a little charming boy. I also met my little sister and my 7-month-old darling niece Pia after a long time. It is always a special feeling to bond with your siblings. March was quite a happening month for me. I was quite active in blogging and engaged with a lot of fellow bloggers who also showed some love for my work here. Writing and blogging have become my panacea of sorts – I feel at peace with myself when I am working on this space. Forever grateful for my time in Dublin, where I had picked up this as a hobby, I never knew I would survive this long. But, now I know that this is not a passing thing. I also encountered an unpleasant tiff with a close friend on a matter that seemed trivial to me. But, it turned out to be a big deal for her. The incident left me shaken for a while and I realized how vulnerable relationships can be at times. But, as they say, there is something to learn in everything – I got my lesson and I moved on. No hard feelings, but I now know where to draw the line. This month also saw me baking like crazy. After a lot of encouragement from some close friends, I decided to put up a stall of homemade brownies and other stuff at our society flea market. It was such a big hit and all the praises that came my way made my day for days to come. I am filled with gratitude to have such encouraging people around me who see the best in me and never fail to uplift me when I need it most. April has been a roller coaster ride, especially the last two weeks. My baking frenzy continued and I must have baked 20+ batches of brownies on people’s demand. It has been such a happy feeling. That is also one reason why I had not been very active in this space here this month. But, I think it’s okay as long as I am doing something worthwhile elsewhere. This month we also celebrated our 10th marriage anniversary. The journey so far has been happening with highs as well as lows, with tears and laughter. But, it has also been a journey of self-discovery for me. Given the fastidious person he is, I think he has played a big role in bringing out the best in me. So, I am forever grateful for that and I am game for anything life throws at me. The happenings of the last few days of April have left me feeling incredulous and I am just amazed at how the Universe responds to one’s wishes. Words have such incredible power – kind, encouraging, appreciating words - they can make you feel – happy and beautiful inside. They can put a spring in your feet, give you goosebumps, and fill your heart with gratitude. Somethings are just beyond ordinary understanding – so I gave up trying to overanalyze and define things and just revelled in the feeling. Somethings are transient, but that doesn't mean that you should not enjoy it. Live in the moment, as they say. In all these months I have maintained a steady reading streak – and I am so happy to say that I am on track for my reading goals this year. Grateful to the two ladies that help me managing my house, so I have some time at hand for my creative pursuits. Here are the names of the books I have read so far. The book reviews for some of these books are not up on the blog yet. They will be up soon though. Overall, I do think it has been a great year so far and I am sure better things are in store. What do you say? If you are on social media, take a minute to follow me there for all sorts of blog updates. Disclaimer: The graphics here has been created using Canva. Some of the images used are stock images. True. The Universe is listening.. Always. It sure can leave us awestruck by its doings. So, it helps being grateful for all that the Universe brings into our life.